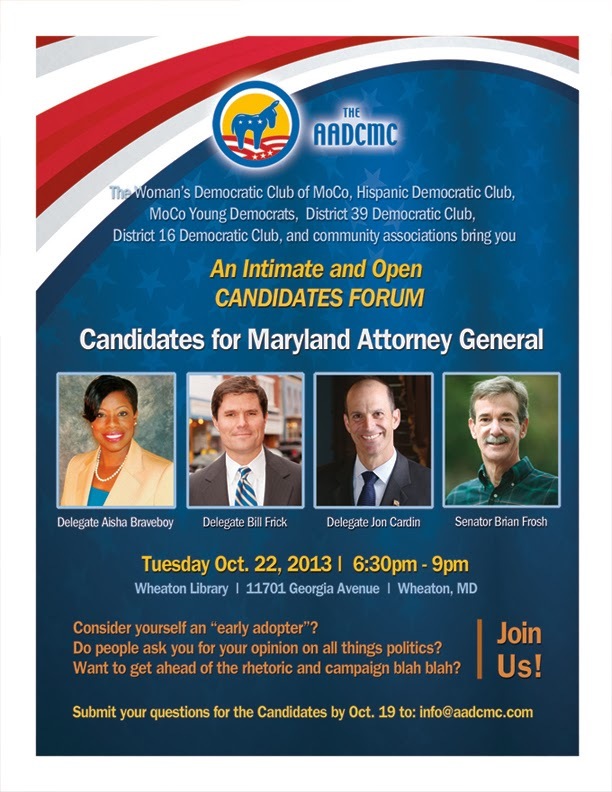 EVENT #1: ATTORNEY GENERAL CANDIDATES FORUM FOR 2014 DEMOCRATIC PRIMARY - Tomorrow, TUE 10/22 from 6:30 to 9:00 pm at Wheaton Library (11701 Georgia Avenue), a number of Democratic clubs is hosting a candidates forum for Attorney General with the four Democratic candidates: Senator Brian Frosh and Delegates Aisha Braveboy, Jon Cardin, and Bill Frick. WHAT: For more than a century the NAACP has worked to ensure the political, educational, social, and economic equality of rights of all persons and to eliminate race-based discrimination. Inspired by the force and commitment of The Call of 1909, which denounced the growing oppression of people of color and mobilized thousands to work to bring this discrimination to an end, the NAACP seeks to establish a strategic direction as it embarks on developing the New Call for the 21st Century for local communities with clear messages.